A Lycan in The Lost and Damned. 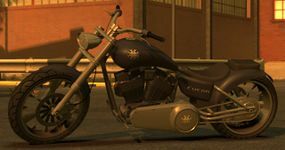 The Lycan is a chopper style motorcycle in the GTA IV episode The Lost and Damned, with an early version of its file existing in Grand Theft Auto IV. The Lycan's design is a combination of a classic motorcycles profile, crossed with modern custom design cues. While similar in design to the Freeway, Nightblade and Wolfsbane, the Lycan's design is distinguishable by its unique rim design which incorporates spikes along the inner rim, unconventionally curving vehicle parts, and a generally lower profile than classic motorcycles. The bike's design is comparable to an Orange County Choppers Pro Street, and is implied by its badging to be built by Liberty Chop Shop. In The Ballad of Gay Tony, a modified Lycan featuring an extended rake and a black paintwork with flame vinyl is featured inside Yusuf Amir's Middle Park East apartment. Because the bike is only a prop, it cannot be ridden. A Lycan extracted from the PC version of Grand Theft Auto IV. The Lycan in its finished form in The Lost and Damned. A custom Lycan in Yusuf Amir's apartment in The Ballad of Gay Tony. Most of the Lycan's road-going capabilities are identical to most chopper bikes in the game, with a standard chopper weight distribution that prevents wheelies and stoppies, a mediocre top speed of 125 kph/77 mph, and good acceleration. Unlike most choppers, which feature a longer rake that extends their wheel base significantly, the Lycan's rake, while slightly extended, is short enough, allowing the bike to corner easier albeit poorer still (requiring the player not apply the throttle when cornering at higher speeds). The bike's braking and grip are average. The Lycan plays Liberty Rock Radio 97.8 by default when entered. Lycanthropy, which the Lycan presumably takes its name from, stands for person who can shapeshift into a wolf, or gain wolf-like characteristics. The Lycan is almost always found outside the Lost MC Clubhouse in traffic, even after the conclusion of TLAD's storyline. If activities are arranged by Johnny with Terry or Clay, and he arrives without a motorcycle, a Lycan will often be found parked on a nearby street. This page was last modified on 24 April 2013, at 14:23.